​I’m not sure if you’ve brought an item of clothing inside a shop only for it to appear a slightly different colour when you go outside? It’s all to do with the ability of the artificial lighting to render colours properly. In this post we explain one of the fundamental principals of artificial light – how do you know the that the light source you are choosing will render colours effectively? It’s all to do with something called the CRI or colour Rendering Index. The CRI value or RA measures the ability of the light source to render 8 pre defined colour swatches, R1 – R8 against a predefined (black body radiator) or “natural” light source for that colour temperature. The extended values test an additional 6 colour swatches; R9-R14. So its important to understand whether the CRI value you are being given is the extended version or not. This isn’t always indicated on the manufacturer data sheet so its important to ask the manufacturer whether they know the R9 value of their light source. If they have a value for R9 then you can safely assume that the CRI value is for the extended version. 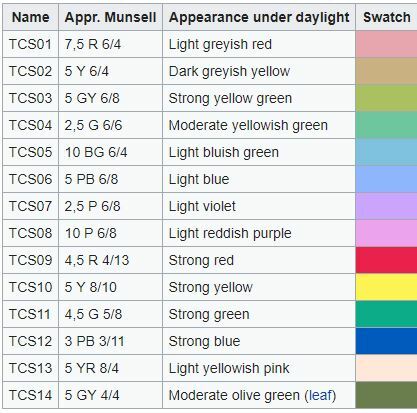 Each swatch is given a score or value out of 100 compared to the original light source then the total is averaged up which gives you your CRI Value for that light source. In an ideal world all light sources we use would have a CRI of 100 to ensure that we have the best quality of light for all our spaces. The reality is that due to the difference in materials used to create high CRI LED light sources can 1/ have a reduced light output and 2/ make the light source more expensive. So LED light sources with a lower CRI are often used, for residential spaces a CRI of 80 is often acceptable. Where as area where colour matching is important for example art work or retail environments a CRI value as high as possible should be used. There has also been on going debate about the relevance of the CRI as a true indicator of defining the ability of the artificial light source to render colours effectively. This is because lighting manufacturers are able to tweak the properties of the light source to match the relevant colour hues. This is great for achieving the high CRI numbers and making it appear to be a high colour rendering light on paper. But may not actually render course truly. This is because the CRI standard is only interested in a small number of colours. The CIE have been trying to agree a new lighting standard that addresses some of the short falls of the current standards for years but have yet to agree a new method. So scientists in the US Department of energy have developed a new(ish) metric that tries to address some of the short falls of the current system called TM30, we will discuss in our next blog post.